In 8-inch square (2-quart) glass baking dish, mix orange peel, orange juice, seasoned salt and 4 cloves chopped garlic. Add shrimp; turn to coat. Cover with plastic wrap; refrigerate up to 2 hours to marinate. In medium bowl, mix all salsa ingredients. Cover; let stand until ready to serve (or refrigerate if longer than 30 minutes). In 10-inch nonstick skillet, heat oil over medium-high heat. Drain shrimp; discard marinade. Cook shrimp in oil 2 to 3 minutes, stirring frequently, until shrimp are pink. Among 4 dinner plates, divide salsa. Arrange shrimp around salsa. 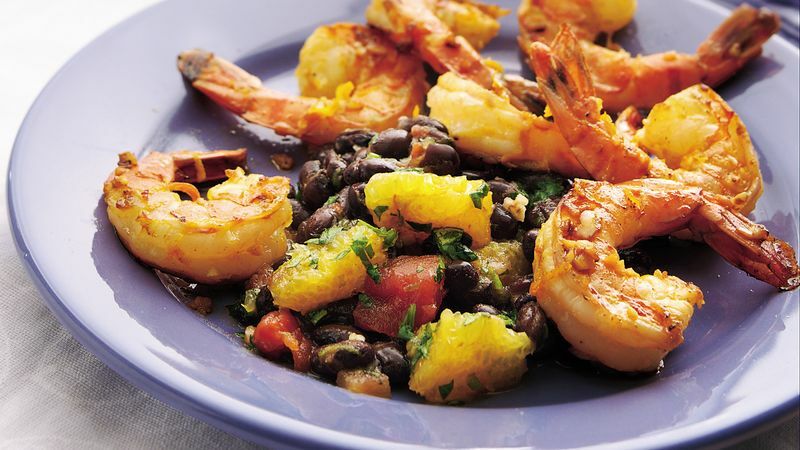 You can make this salad ahead of time; cover and refrigerate the cooked shrimp separately from the salsa. Just before serving, arrange on plates. You can use red beans instead of black beans if you like.